Description: Typically, Reptilians are described as 6 to 8 feet tall, bipedal, having scaly green skin, have a bad odor, have large eyes usually yellow or gold with a vertical pupil. They are sometimes linked to myths about ancient astronauts who allegedly came to Earth to seed the planet and promised to return one day. Theories involving Reptilian aliens are metaphoric in content, much like other creational myths throughout the programs of reality, weaving together clues to help one figure out humanity's journey in linear time. 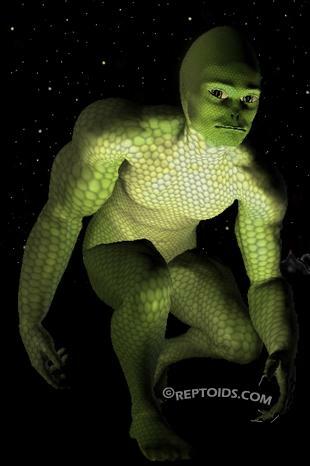 Reptilian humanoids are a proposed race of intelligent, supernatural, or highly developed reptile-like humanoids in mythology, popular fiction, pseudoscientific theories and in the writings of New Age conspiracists. They appear in some conspiracy theories, most notably those of Riley Martin, John Rhodes, David Icke, and in science fiction. Reptoids, a conjoined word defining Reptilian-Humanoid beings, is the most popular name used to describe these cryptid beings, although some authors also refer to them as dinosauroids, lizardfolk or lizardmen. Other names include Draconians, Saurians and Sauroids. They are often described as being green or gold color. 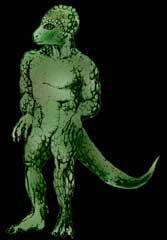 Similar to the other cryptids, no one has produced proof of the existence of reptilian humanoids, and allegations of their existence can at best be referred to as cryptozoology or pseudoscience. 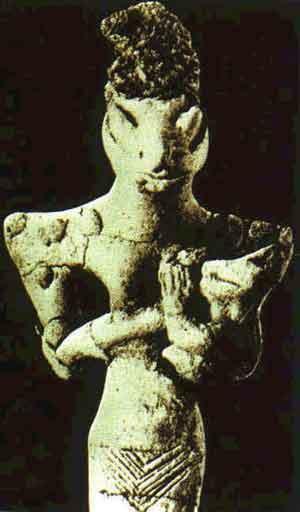 Several ancient peoples all over the world have described reptilian beings, and some have described reptilian humanoids. Common in numerous mythologies are tales of reptilian creatures (usually not humanoid) who are often, but not always, hostile to human beings. Also rather common are the myths of "Serpents of Wisdom" who enlightened humanity before the dawn of civilization. Some individuals, doubting claims of reptilian humanoid sightings or contacts, suggest that the mythological preeminence of reptilian forms could stem from a genetic memory of instincts developed millions of years ago, when mammals were the prey of the reptiles which dominated the Earth. Dreams of reptiles are often interpreted as symbolizing "ancient drives" and "instinctive responses". The Toltec Mayan god Gucumatz was described as a "serpent of wisdom" who enlightened humankind. His Aztec counterpart was named Quetzalcoatl. In the Yucatan, he is called Kukulcan. The Hopi refer to a race of reptoids called the Sheti, or "Snake-Brothers", who live underground. The Cherokee and other Native American peoples also refer to reptoid races. In pre-Columbian mythology from Colombia, Bachue (the primordial woman) transformed into a big snake. She is also sometimes called the "Celestial Snake" (Serpiente Celestial). Many users of the drug Dimethyltryptamine (the active ingredient in many South American shamanic potions such as ayahuasca) have seen reptilian humanoids or reptilian disincarnate entities and aliens while hallucinating (Strassman 2000). Cecrops I, the legendary first King of Athens was said to have been half man, half snake. The ancient Titans and Gigantes were sometimes depicted as winged man-like beings with serpents instead of legs, for example on a fresco on a temple in Pergamum. In these images from Pergamum, some of which depict the gigantomachy, one sees the giant Klyteios with huge serpents in place of legs. Boreas (Aquilon to the Romans) was the Greek god of the cold north wind, described by Pausanias as a winged man with serpents for legs. The European dragon dates back to ancient depictions on various archaeological artifacts. An early instance in literature was the dragon that guarded the Golden Fleece in the Voyage of the Argonauts. In the Middle Ages, tales of dragons seem to have become even more common. The dragon in Europe, as a rule, was not conceived as having a humanoid form, and would not qualify as an instance of a reptilian humanoid unless explicitly described as humanoid. In Indian scriptures and legends the Naga are reptilian beings said to live underground and interact with human beings on the surface. Some are alleged to turn human. In some versions, these beings were said to have once lived on a continent in the Indian Ocean that sank beneath the waves. 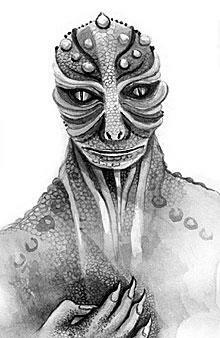 Indian texts also refer to a reptilian race called the "Sarpa. The Syrictae of India were a tribe of men with snake-like nostrils in place of noses and bandy serpentine legs. The Chinese, Korean and Japanese speak throughout their history of Lóng (Yong in Korean, Ryu in Japanese) or dragons, conceived of in both physical and non-physical forms, but rarely depicted in humanoid form, though they may assume a non-reptilian human form. The Japanese have tales of Kappa, a basically reptilian humanoid. In China, Korea and Japan, underwater realms where the Dragon Kings and their descendants live are referred to, as well as the lineage of humans from a race of dragons. This lineage was often claimed by Asian Emperors, who were believed to be able to change from human to dragon form at will, much like the modern concept of shapeshifting reptilians. However, the dragon is seen as good rather than evil in Eastern tradition. In the Middle East, reptilian beings ranging from certain Jinn to dragons and serpent-men have been spoken of since ancient times. In one of the apocryphal books purporting to be the lost Book of Jasher, a serpent race is described. In the Book of Genesis, God punishes the serpent for deceiving Eve into eating the fruit of the Tree of Knowledge of Good and Evil by decreeing, "Upon thy belly thou shalt go, and dust shalt thou eat all the days of your life" (Genesis 3:14 KJV). Traditionally, many have felt this implied that the serpent (a snake or reptile) had legs before then. Thus It is therefore often portrayed in Western art as a humanoid (woman) with a snake's tail, and sometimes lizard-like feet, as in a detail from Bosch's Last Judgement. In the Middle Ages down to modern times, the Devil was often conceived as a humanoid with reptilian characteristics, as were demons in general. But the New Testament reference of Revelation 12:9 which identifies the serpent of Genesis as Satan himself (the "dragon, devil, Satan, ancient serpent," etc.) gives insight from another angle. The serpent in the Garden of Eden was Satan himself, a beautiful supernatural being (either called a "serpent" symbolically, or because he manifested himself commonly in a dragon/serpent-like form). Hence the reference to "crawling" and "eating dust" is purely symbolic of his ultimate defeat and humiliation. In Africa, some shamans claim to bear extensive esoteric knowledge of a race of reptilians called the Chitauri, whom they say control the Earth. They also claim to have accounts of a reptilian race who created them and used them to work their gold mines. The Chitauri are an ancient technologically advanced race of extraterrestrial fanatics dedicated to controlling all other life in the universe, eradicating that which they cannot control. Determined to bring harmony to the universe since the dawn of time, they regard themselves as the universe's immune system, purging diseases such as chaos, disorder and independent thought. Dubbed the Chitauri by Africans who encountered them on Earth, these aliens have been known as the Annunaki or Skrulls on other worlds. Within their own society, they have little use for individual names or personalities, functioning as a collective with shared goals and values; however, they do assume identities while infiltrating the races of other worlds. They have replicated the appearance of other life forms, but must consume their victims first in order to assume their shapes. 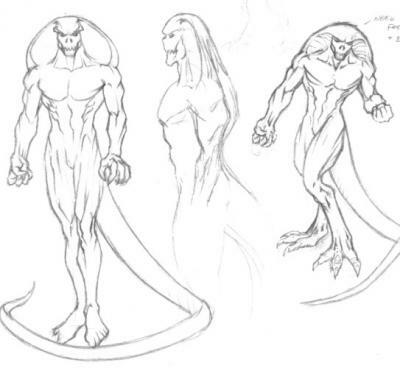 In their natural state, the Chitauri are eight feet tall and reptilian in appearance. At least some of them posses enhance strength, durability, senses, and regenerative powers. Their ruling class apparently possesses these traits in greater abundance then the rank and file. They reportedly spend at least part of their lives in realms beyond three-dimensional space, but use their shape-shifting powers to assume forms better suited to three dimensions when operating within our reality. Even in modern times, some claim to have encountered reptilian humanoids. In many of these cases, a UFO is part of the encounter; alien abduction narratives sometimes allege contact with reptilian creatures. In a thought experiment published in 1982, paleontologist Dale Russell, curator of vertebrate fossils at the National Museum of Canada in Ottawa, conjectured that, had the Chicxulub meteorite not exterminated the dinosaurs 65 million years ago, bipedal predators (theropods) which existed at that time, such as Troodon, would have evolved into intelligent beings similar in body plan to humans. Troodontids had semi-manipulative fingers, able to grasp and hold objects to a certain degree, and binocular vision. Like most dinosaurs of the troodontid family, this imaginary creature, which Russell called the "Dinosauroid", would have had large eyes and three fingers on each hand, one of which would have been partially opposed. As with most modern reptiles (and birds), its genitalia would have been internal. Russell speculated that it would have required a navel, as a placenta aids the development of a large brain case, however it would not have possessed mammary glands, and would have fed its young, as birds do, on regurgitated food. Its language would have sounded somewhat like bird song. Russell's fanciful speculation has been met with criticism from other paleontologists since the 1980s, many of whom point out that Russell's Dinosauroid is overly anthropomorphic. Gregory S. Paul (1988) and Thomas R. Holtz Jr., consider it "suspiciously human" (Paul, 1988) and argue that a large-brained, highly intelligent troodontid would retain a more standard theropod body plan, with a horizontal posture and long tail, and would probably manipulate objects with the snout and feet in the manner of a bird, rather than with human-like "hands". Darren Naish (2006) pointed to the ground hornbill as a better model for an intelligent dinosaur. Artists have used these new approaches to the original thought experiment to re-interpret the Dinosauroid, going so far as to create "Dinosauroid cave art", which depicts sentient, tool-using troodontids and other dinosaurs and pterosaurs, painted using sticks and feathers. 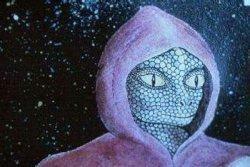 There are many conspiracy theories involving reptilian extraterrestrials, or terrestials of reptilian lineage. Many posit that the so-called Greys are in fact reptiles, and should be categorized as "Reptoids", others that Reptoids are an entirely different species working with or in opposition to the Greys. Some have also claimed that they are capable of shape-shifting (Icke, 2004). One of the earliest, modern-day reports is that of Ashland, Nebraska police officer Herbert Schirmer. On December 3, 1967, Schirmer claims to have been taken aboard a UFO that appeared just outside of Ashland, where he encountered humanoid beings, 4 feet 6 inches to 5 feet tall, who wore close-fitting silvery gray uniforms, boots, and gloves. Their heads were thin, and longer than a human head. The skin on their faces was grey-white, the nose flat, the mouth merely a slit which did not move, even when they spoke. Their eyes were slightly slanted. While only slightly reptilian in their outward appearance, these beings bore a "winged serpent" emblem on the left side of their chest. Schirmer alleged that the beings are from another galaxy, and have bases on Earth. John Rhodes was the first person to seriously investigate and publicly present claims of reptilian-humanoid sightings and/or contact. He established the Reptoids.com Research Center in 1997 to collect, review and present evidence of reptoid activity. He has also appeared on television and radio shows being interviewed about his discoveries and the science supporting the theory of Reptoids. Rhodes contends that the majority of the reptilian humanoids are descendants of the dinosaurs and are biological byproducts of Earth evolution. He also states that human attention has been intentionally misdirected away from the underworld toward deep space, so the subject of underground Earth dwelling Reptoids and lost ancient civilizations can remain secret. Rhodes also adds that most accusations of politicians shape-shifting into reptilian humanoids are totally unfounded, and that such reports are simply projections of collective fear and blame for the world's conditions. When questioned as to why Reptoids have become the proverbial "whipping boys" of modern ufology, he responds that it is because people tend to have a knee-jerk reaction to the image that western religious authorities have conditioned us to fear and distrust. A subterranean Nazi-friendly super race is sometimes associated with accounts of reptilian humanoids, and also with the telekinetic super race depicted in Vril: The Power of the Coming Race. Riley Martin, author of The Coming of Tan and frequent guest of Howard Stern, claims personal knowledge of Targzissians, a malevolent race of reptilians who manage to coexist with six other types of aliens on a mother ship near Saturn. Paul Shockley, a self-professed psychic, also speaks of malevolent reptilian beings. However, he explains that he does not believe that all reptilians are malevolent, and that there are benevolent members of this species as well. According to David Icke reptilian humanoids are the force behind a worldwide conspiracy directed at manipulation and control of humanity. He contends that most of our world's leaders, from George W. Bush to members of the British royal family, are in fact 7-foot tall, blood-drinking reptilians from the star system Alpha Draconia. According to an interview with David Icke, Christine Fitzgerald, a confidante of Diana, Princess of Wales, claims that Diana told her that the Royal Family were reptilian aliens, and that they could shapeshift. David Icke and others have claimed that U.S. President George W. Bush and his family are part of this same bloodline (Icke, 2004). Icke claims, based on his exploration of genealogical connections to European royalty, that many presidents of the United States have been and are reptilian humanoids. In his view, United States foreign policy after September 11 is the product of a reptilian conspiracy to enslave humanity, with George W. Bush as a servant of the lizards. He also theorizes that the reptilians came here from the constellation Draco. One type of reptilian entity that people see during alleged encounters resembles reptoids like those that are addressed in the studies of John Rhodes and the Reptoids Research Center. Like most conspiracy theories, proving Icke's hypotheses is impossible, but he continues to sell books and give speaking engagements based on concepts ranging from the New Age to his political opinions. Others who share the negative viewpoint of reptilian humanoids include Cathy O'Brien, a woman who claims to be a victim of CIA MKULTRA mind-control. O'Brien says in her book "The Trance-formation of America" (with Mark Phillips) that she witnessed George Bush Sr. physically shapeshift into a reptilian alien being. She rationalized this as potentially being a holographic illusion as part of her mind control programming. Arizona Wilder reported similar sightings of prominent politicians shape-shifting into reptilian beings during Illuminati blood rituals. While her claims sound frightening, no supporting evidence or additional eyewitnesses exist. Patrick Bellringer and other supporters of NESARA also claim that George Bush is a reptilian. In this scenario, the announcement and implementation of NESARA (a law passed in secret) will ultimately end reptilian control over the planet Earth. Reptilian humanoid aliens figured prominently in the 2003 murder trial of David Icke fan Linda Henning who was eventually convicted of murdering her boyfriend's ex-wife, Girly Chew Hossencofft. The trial was covered by CourtTV, providing national exposure to the conspiracy theories involving such creatures. Henning allegedly believed or was told by co-conspirator Diazien Hossencofft that Girly's killing would serve as good practice for the upcoming showdown with the reptilians. Familiar themes of a Bush family reptilian connection surfaced in evidence seized in connection with the trial. Both Henning and Hossencofft are serving life sentences. Zecharia Sitchin claims to have translated Sumerian tablets referring to an alien race which created a race of humans to work as slaves in their mines in Africa. This race is called the Anunnaki and Sitchin claims that the "Black-headed" people of Sumer were created by these beings by mingling the "life-essences" of "man and beast". According to Sitchin, the "Black-headed people" were considered slaves in the Sumerian caste hierarchy beneath their creators. The Sumerian Tablets refer to the creation of the Black-headed people in the geographical area called 'AB.ZU. ', which is said to correspond to West Africa. See also Stargate. The royalty was said to be a combination between "dragons" and humans, or to be direct descendants of the Sun God, Shamhash. Contrary to the claims of David Icke, the Draconian Sun-God aspect of the royalty does not correspond to the Anunnaki, but to a different set of gods. Anunnaki comprised only 23 gods in the Sumerian pantheon, including Enlil (lord of wind/air) and Enki (lord of earth). Other gods were not Anunnaki at all, but were personifications of the Sun, or what were described as 'Sir', or Dragons, in Babylonian. This word, 'Sir', also apparently meant 'great serpent', and is related to the Sanskrit word 'Sarpa', which was also used to describe great "Dragon-Gods" who ruled over, and created, the original Dravidian culture. Sitchin also suggests that the Annunaki probably still exist in some form or another, with some degree of influence over humanity. These beings are speculated to be either amphibious, reptilian, or quasi-reptilian, from ancient description. According to Arizona Wilder, who claims to be a former mind-controlled subject of MK-Ultra (much like Cathy O'Brien), Zecharia Sitchin is in league with the reptilians as a disinformation agent. She claims to have seen him with other shape-shifting reptilians at many high-level functions attended by the world's "elite". Her claim to have been a subject of mind control makes her "eyewitness" accounts suspect. Laurence Gardner, historian and holder of many other titles (the validity of which have been debated), claims that a "Dragon Bloodline" (a "Holy Grail") was created in ancient Sumer when reptilian aliens called "Anunnaki" descended upon the region and created a royal bloodline through genetic engineering. Stewart Swerdlow, and old friend from NY, claims to possess extensive knowledge of alien intervention in Earth-human society, and describes in detail the activities of a Reptilian race called the Draco, originating in the Draco star system. He also mentions a more benevolent reptilian race called the Anunnaki, the Sumerian Program, which created the Black race in Africa. He claims that this is supported by ancient Sumerian tablets, as well as the histories of the indigenous peoples of Africa, such as the Zulu, as well as physical evidence such as ancient mines which have been discovered by the Anglo American Corporation, dating to 60,000 years B.C. Today, there have been 12 visitors (21 hits) on this page!